I am deeply honored to be serving as the President of the Kansas Sheriff’s Association for 2018. I am equally honored to be serving my community as their Sheriff for 21 years. Clearly, Sheriffs must understand the terrific opportunity given them to serve and protect our citizens. We must always remember to do so with the utmost respect and integrity of our Office. 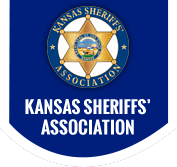 The Kansas Sheriffs' Association was founded in 1957 to unite all the Kansas Sheriffs in providing the best possible service to those we serve. The Association accomplishes this through our daily interaction with Sheriffs, and their staffs, and in providing training, legislative efforts, scholarships, and in highlighting the most current and effective law enforcement products available. Our Association was experiencing some financial concerns a few years ago with the loss of an important fund-raising program. However, we have rebounded thanks to the results of our new direct mail fundraising campaign. The citizens of Kansas have clearly shown their enormous support for Kansas Sheriffs and we are extremely grateful. As we move forward for 2018 let us always remember the importance of service and to those we serve.